In the years of creating episodes for our national television series, Growing a Greener World on PBS, we’ve had the privilege of meeting and featuring some of the world’s most genuine heroes to tell their extraordinary stories. Each is doing something incredible for people or the planet through organic gardening, healthy food, nurturing sustainable lifestyles and more. 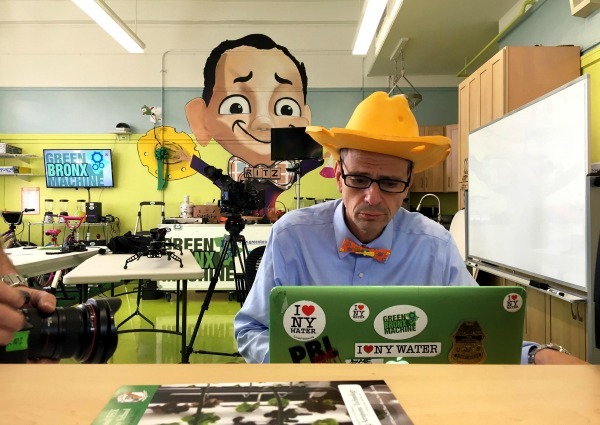 Stephen Ritz – The man with the ever-present cheese hat, and founder of the Green Bronx Machine. And perhaps the most tireless man we’ve ever met. Then along came Stephen Ritz, educator, creator, and founder of the Green Bronx Machine. It’s the term given to his one-of-a-kind incredible learning environment, originally started and still growing strong in the Bronx and now spreading out around the world. On breaks from college, Daughter Michaela Ritz is an ever-present force of her own at CS-55. Over the three days our crew was embedded in CS-55, the school where Stephen voluntarily spends most of his life (along with his wife Lizette and adult daughter Michaela), our unique perspective allowed witness to a man fully present in his life’s mission—to nurture his students with love and respect. It moved us to tears more than once as we savored every moment of joy and energy radiating from his students in response. 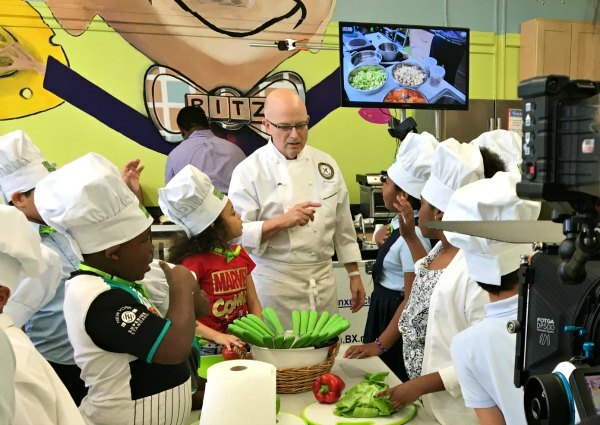 Former White House pastry chef Bill Yosses has become an integral part of the Green Bronx Machine volunteer force. It only takes a moment after meeting Stephen to know that this is a man devoted to changing the lives of his students. 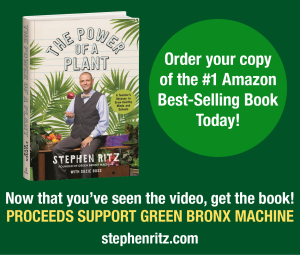 Through passion, patience, and the power of a plant that produces real food (as in fresh fruits and vegetables), Stephen Ritz and his Green Bronx Machine are building healthy minds and bodies and empowering thousands of children to discover and exploit the potential they never knew they had. Stephen Ritz is like the Pied Piper. Students savor every moment of “Mr. Ritz time”. Although this episode packs a lot into a 22-minute show, you can learn much more of the story behind it all. The Power of a Plant is the recently released book on the extraordinary journey of Stephen Ritz—indeed one of the world’s most genuine heroes and important role models of our time. To all of you who watched this episode to the very end, this one got me as you now know. After days of seeing so much love from students to teacher, and back again, it was a lot of emotion to keep bottled up. We made two separate trips to NY to finish this episode. After returning home from the first trip I truly was emotionally spent. Knowing I was going back for another round, just added to what was already still inside me. These hugs happen every morning. You can tell some of the students really need these. What a way to start the day. I wish you could have seen what I saw and will never forget over those three days. This image I call “the hug” was just the tip of the iceberg on what I was able to experience. After witnessing many more scenes like this, I plan to give more hugs and hopefully get more hugs. While the “power of a plant” is truly an amazing thing, you still can’t replace the incredible power of a hug. Thankfully, Stephen Ritz is good with both. This was an awesome show! Impact me greatly! This is all wonderful but how can such an extensive program be FREE?? Wow! And he does it for free. His work is amazing and his results tell all. Thank you for sharing this. Know that what you’re doing has an amazing impact as well. We need you to do the work that you’re doing – and you do it so well. Congrats Joe for winning an EMMY! You deserve it. I have learned so much from you over the years and been so inspired by your show. I can’t tell you how happy we are that you FINALLY got recognition for all your hard work and knowledge. The way you share it makes it easy for everyone to understand and be inspired. Keep up the great work, we all love you very much. Hi, i very much like this episode and made me interested in watching the others. I really think its great that these kids are being educated in a fun and interesting way. Thank you for your positive feedback. I’m glad you enjoyed the episode about the Green Bronx Machine. The music used for the background was composed for this show by Todd Locke and performed by Tony Anderson. You can find Tony Anderson on Spotify. We are currently filming episodes now for season nine which will air in 2018. Stay tuned for updates. Until then, happy gardening. For the tower gardens do they use the nutrients supplied by Tower Garden or do they use another formula? The kit comes with nutrients but you can also get your own from a store that sells hydroponic supplies. I hope this helps. Happy gardening. Wow, Joe Lamp’l and GGWTV. I’m so inspired by all your shows. Since discovering this episode a few days ago I’ve gone down the rabbit trail, watching and reading everything I could find on the Green Bronx Machine and the incredibly passionate and energetic Steven Ritz. His GBM project is living proof that real, healthy, homegrown food has the power to transform lives and communities. Thank you for this beautiful story! Hi Teri. Thank you! Yes, we loved the GBM story as well. Stephen Ritz is one of my new-ish heroes! I’m thrilled we were able to tell his story and that so many have appreciated watching it. Thanks for writing and so glad you found us! This has been the most inspiring show I have ever seen. If more gardeners would become involved in children”s lives in this way or even apply it by growing community gardens with your neighbors, no one would ever go hungry. I live in the Mississippi Delta and there is a lot of poverty. When people can”t afford good food sickness follows. Thank you so much for everything you and the show staff do. And thank you to the Create channel for providing this kind of programming. Hi Wanda. Thank you very much! I’m with you. Totally inspiring indeed to see the good work Stephen Ritz and his Green Bronx Machine are doing to set examples of what is possible, literally around the world. Thank you for taking the time to write and share your kind words with us. 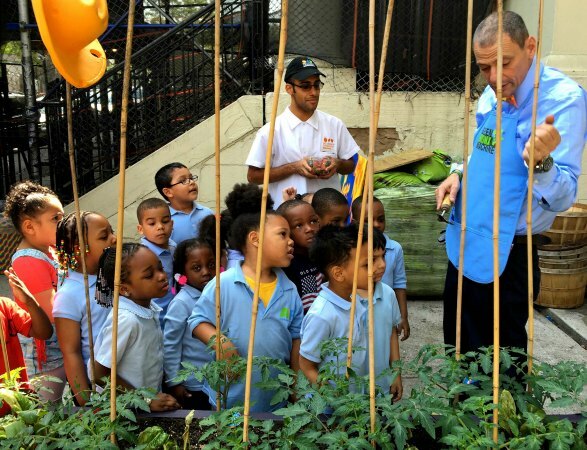 The green Bronx machine episode was in my opinion, the best gardening television episode I’ve ever seen, and know it will encourage other teachers to use gardening to facilitate learning. Love the show, enjoying the new format, so pleased to have a gardening show, thank you Joe Lamp’l and PBS! Wow Pat. That is pretty much the ultimate compliment! I will be sharing your kind words with our team and Stephen Ritz and the Green Bronx Machine as well! Thank you so much for all of this. Awesome, awesome episode!!! I will definitely check out the website and purchase the book. Bless you Stephen, your family and all those involved. One of our many favorite episodes !!!! We need so many more world changers like this amazing man. Thank you Joe for finding these people and letting the world know the amazing work that they are doing. I loved this emotional and inspiring episode ~ thank you to Steven Ritz and thank you Joe Lamp’l for bringing us the story. Hey! I heard you this morning on WSB so I thouht I would take a look at your show. I grew up in the South Bronx, went to PS 75. When I was 9 years old I discovered the NYBG Gardencrafter Program where for $3 they would teach you how to grow veggies all summer. I experienced everything Mr. Ritz described (on Saturday mornings). They even made a movie about it which I would love to see again but there’s only one copy of it in a vault and they want a lot of $ to restore it ☹️, The whole gardening experience absolutely changed my life and that of my whole family , just like he said. LOL, I’m 60 now and still eat tons of salad daily and taught art in a special ed school and did a little gardening program on the side with some of my students and saw the same thing happen. BTW, I was surprised to hear that Milorganite was a sponsor since When I was taking the Master Gardener training class one of the presenters was talking about how it has heavy metals like cadmium and lead in it and we should never advocate its use. PS, your show is lovely. Hi Lauren. Glad you found us. And glad to hear you too were involved in educating students through gardening. I’ll ping Milorganite and see if we can have them respond to your comment/question on that. Thanks. Hi Lauren, The topic of metals and their role in promoting plant health can be quite confusing, particularly when it comes to products like Milorganite. Here’s something that you may already know; metals such as Zinc, Iron, Copper, Boron, Manganese, Magnesium, and Molybdenum are all vital nutrients. These elements along with Nitrogen, Phosphorus, Potassium, Calcium, Chlorine, and Sulfur are what make up the essential nutrients for plant health. -Milorganite – For Better Results. Naturally. I stick with my compost, healthy soil biology, all you need. Hey Lauren. I just saw that Milorganite responded to my ping from your inquiry. Scroll up to the top of these comments and you will see their reply. I just have one request if you would like any follow-up info or continue this discussion and that is to email them directly at the address provided in their comment. That way they’ll be sure to see it as they don’t normally follow these threads here. Thanks! Meeting and working with Joe and Carl was a highlight of my career and an incredible experience for my students, colleagues and family – we are forever grateful! To learn more about our work please visit our website: https://greenbronxmachine.org/. To learn more about our book or to purchase a copy – proceeds support the program – visit my personal website here: http://stephenritz.com/the-power-of-a-plant/. Thanks for watching the episode and hope to hear from you soon! Stephen Ritz & Green Bronx Machine. This was one of the best episodes ever. 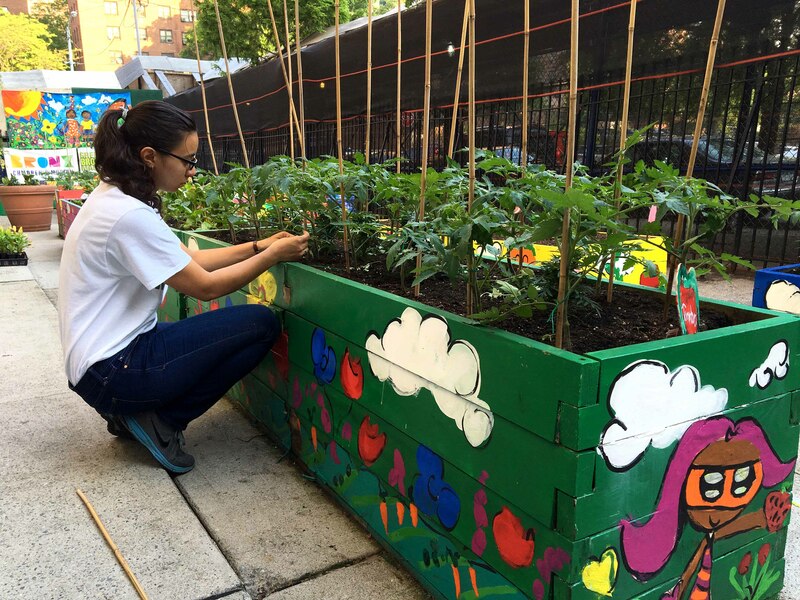 Imagine if every school in the country had a hands-on garden, starting with elementary school. Children are naturally enthusiastic and appreciate a truly happy and loving teacher like Mr. Ritz. With him they learn, work and celebrate the “fruit” of their efforts. It must be the most satisfying part of their school schedule. There is joy and sacredness in “Growing a greener world,” and the children know it. Thank you, Gloria. I agree. And I do think we are on the cusp of a great movement towards gardeners in every school and potentially classroom. The benefits are undeniable and the engagement from the students is unmatched by anything else.